Araatris: The huntress wakes to a familiar, gentle gait, and she raises her groggy head to find herself leaning against the scruff of Vorok’s neck. Rhoelyn: “You’re awake.” Firm hands support her as she sits up. The world is blurry and she blinks, clearing her vision to look at the man behind her. Araatris: The huntress blushes as he reaches back and pulls free a satchel heavy with food. “I believe you have more orders to fulfill.” Nysse takes it. Araatris: The green-haired elf looks around at the party mounted around them. Rhoelyn sits, stiff-backed, before Leothir on his hawkstrider, Yami with her. Rhoelyn: Nithan grumbles as he tightens his grip about her, “Stop wiggling, girl.” Wrune presses his lips into a thin line, but it’s Relare that answers. Araatris: “His temper got the better of him,” the commander grumbles, looking surly. Aron sighs. “He’s back there. Pouting, if I had to guess,” he explains. Araatris: Wrune blinks at her. “The man who was with Aleesa?” When Nysse nods, he pinches the bridge of his nose and glances at Relare. Rhoelyn: The green-haired woman cries out as his grip tightens, bringing tears to her eyes. “I know!” Nysse yanks away, trying to throw herself off Vorok. Araatris: Taken by surprise, the healer fails to grab her, and she tumbles roughly to the ground, the satchel of food landing beside her with a dull thud. Araatris: Nithan scowls down at her as the others pull their mounts to a stop. “It’s t-” He’s hit by a dark silver streak, and they tumble to the ground. Rhoelyn: Nysse turns red, then purple. She pinches the bridge of her nose with a dark look. Using a sharp tone, she snarls, “Rhese! Heel!” Yami winces. Araatris: The cat snarls once more for good measure in Nithan’s face before he climbs off him and stalks over to Nysse’s side. He looks decidedly smug. Araatris: He rubs along her leg before shifting back to rest a hand on her shoulder. “You ride. He walks,” Rhese growls, watching as Ry helps Nithan up. Araatris: Relare frowns at Rhese. “Do I need to chain you, again?” The druid glowers up at him. “You won’t get a sec-” “Brother. Enough.” Rhoe’s soft words stop him. Rhoelyn: The druid sullenly quiets. Rhoelyn suggests, “Please ride with Nysse. She needs you.” Nysse blushes and stares at the satchel in her arms. Araatris: “Let’s get moving.” Wrune’s words spur everyone to action, and soon Ry is settled on his charger and Rhese and Nysse on Vorok. The wolf grumbles. Rhoelyn: “Is it bad if she does?” Nysse notices Relare’s gaze on her, but he looks away when their eyes meet. “Who’s that ahead?” The paladin points. Araatris: “I don’t know h-,” Wrune starts, but Rhese interrupts, incredulous. “The sour squidf-” Nysse elbows him hard in the ribs. “Valerio!” She grins. Rhoelyn: The huntress swings her leg over Vorok and drops to the ground running. “Nysse! Wait!” The druid makes a futile grab as she dives ahead. Araatris: Hands on his hips, the big draenei hunter smiles at her approach. Vulf waits by his side. “Hello, green leaf,” he says when she gets close. Rhoelyn: Vulf wuffs at her and she ruffles his fur affectionately. “What are you doing here? You should be miles away.” Rhese joins them on Vorok. Araatris: The party follows him off the road and through a thin copse of trees to an overgrown trail that leads around the edge of a teal, cloudy lake. Araatris: Rhese swings down from the wolf’s back, helping Nysse as the others dismount around them. His amber gaze takes in all the camp details. 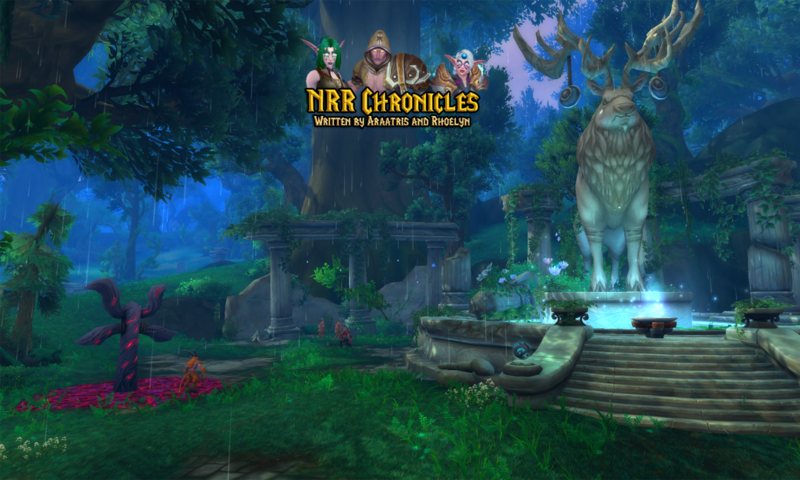 Rhoelyn: Kaldorei and draenei mill about the area, tending fires and cooking. Many are recognizable from the camp, especially Faye at the cooking pots. Araatris: Nysse grins to see her and glances over at Nithan, who stands frozen by Rylana’s mount, staring at the teal-haired cook. His expression darkens. Araatris: The medic pauses beside the cook fire, waiting with folded arms and thunderous scowl for her to notice him. When she finally glances up, she gasps. Araatris: He blinks at that. “I would have…” “Would have what?” she prompts. “Asked very nicely? Perhaps tried to buy me like a vase?” Nithan winces. Araatris: “Yes,” the huntress says happily, digging back in to her dinner bowl. They turn their attention back to where Aleesa is talking with Relare. Araatris: Aleesa closes her milky eyes and lowers her head. Her nod is barely perceptible. His brother exclaims, “What? !” He shoves up from his seat. Rhoelyn: Relare sighs, “You believe eno-” Nysse interjects timidly, “I… I don’t want you to die either. Y-you’re a good man.” Rhese stares incredulously. Rhoelyn: Nysse rests a hand on Rhese’s arm. “Leothir, Rhese, no one wants to see their family die. Aleesa, can’t we do anything?” The huntress pleads. Rhoelyn: Rhese tugs Nysse up with him as he stands. “Nysse, I need to talk to you for a moment.” He pulls her away from the others, out of hearing. Araatris: “I don’t think it matters, Nysse. Whatever he was or wasn’t, we still have to fix everything. No matter what becomes of him.” He glances back. Rhoelyn: Nysse nods and rubs at her eyes. “I… I need to go for a run. You should spend some time with Rhoe, alone if they’ll let you.” She pulls away. Rhoelyn: The huntress freezes, startled, then nods and backs away. She whistles and all the wolves, even Vulf, make their way after her running form. Araatris: Her mate scratches at his silver hair, watching the wildling and her little pack run off into the growing dark and feeling like he missed something. Rhoelyn: “Vulf! Where are you going?” Valerio pauses at Rhese and looks between his expression and the darkness. “Oh. She’s hiding again.” Val sighs. Araatris: The druid sighs as well and settles before the fire. “I don’t think she liked our conversation.” He snaps a twig, looking over at Rhoelyn. Araatris: Rhese nods and looks over at Valerio thoughtfully. Eventually, he says, “Where is Morthis? We haven’t seen him, yet.” The hunter shrugs. Rhoelyn: “I’m not sure. He’s been busy preparing for the bronze. He might be at the stables or the table he set up to work.” Rhoe stands and looks their way. Rhoelyn: “If I see him, I’ll let him know you’re looking.” The draenei steps away. Rhoelyn rests her hand on her brother’s arm, but waits for him to speak. Araatris: “Turn around. I’ll get it off you now, and you can throw it into the fire.” The druid is unable to resist shooting a quick glare at Leothir. Rhoelyn: The priestess twists around, drawing her hair away from her neck. Rhese unbuckles the artisan leather collar and presses it into her hands. Araatris: (c) chain through her fingers before she looks up to find the blood elven mage watching her. Calmly and without rancor, she tosses it all in the fire. Araatris: “You two. You’re both shoving me at each other.” Rhese smirks. “Come on, sis. Let’s take a walk.” He stands and holds his hand out to her. Rhoelyn: “What Aleesa told us makes sense. We’re pulled to each other for reasons we didn’t know at the time.” She giggles and fixes his stray hairs. Araatris: “Certainly, there are pulls here that seem… contrary to the way our world should work,” Rhoe says. Rhese tucks her hand in his elbow as they walk. Araatris: “… should I kill him? Leothir. He says you are mates, and I know that… that seldom requires your wi-” He stops when she shakes her head. Rhoelyn: Rhoelyn is slow to answer, “Leothir and I have an… understanding. He is misguided, but well-intentioned.” She tilts her head to look at him. Rhoelyn: Rhoelyn rests her head on his chest. “I hope so, too.” She wraps her arms around him. They stay like that for a while, taking comfort in each other. Araatris: Back at the campfire, Rylana yawns, drooping where she leans against the log. Wrune, Leothir and Relare speak with Aleesa softly, Hadaal hovering. Rhoelyn: Wrune glances over and excuses myself, “Pardon me. I think it’s time we get some rest.” The human paladin stands and pats Ry’s shoulder. Araatris: Hadaal, who seems to sound grumpy whenever he speaks, growls, “I’ll show you the bedrolls.” Rylana staggers after him, rubbing her eye.